Rated 5 out of 5 by taraji6 from When will I see you again??? I have played all three and have been anxiously awaiting a number 4!!! When? When? When???? Rated 5 out of 5 by Landarch223 from Great game! I purchased this game, and even though I've completed all the levels several times, I keep going back to play it again and again. It's always a little different, challenging, entertaining, and just plain fun. Well worth the purchase price because you can enjoy playing it more than once. Nice graphics, too. Try it -- you'll like it! Rated 5 out of 5 by LPERM from Great match 3 game Played this last year and loved it. Nothing new in match 3 came out recently so I am playing it again. Rated 5 out of 5 by sandaral from Lot's O' Fun This game is so much fun it has me coming back again. Rated 4 out of 5 by Cherubabies from Adorable! I love the little Crab character, he is so cute! I especially love the way he pokes out his tongue at you and goes bla, bla, bla. I would have given it a perfect score if it didn't have any Puzzles or that idiotic Mahjong game in it. I hate Mahjong! They are a waste of time and a distraction to the game, and the Skip Button is very very slow. I hope there will be more of this series with an OPTION to pass all the Puzzles. 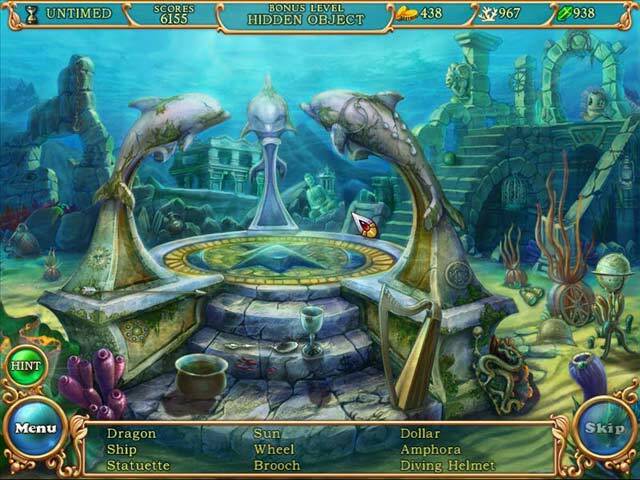 Rated 4 out of 5 by deddu from Hidden Wonders 3 I have played all three games in this series. You can play timed or untimed in this one. The untimed has a skip and hint button. You earn money to rebuild Atlantis. There are over 200 levels and five ending levels. This game has similar boards as the first two, e.g. swap tiles, group tiles, collapse tiles, mini-games, hidden objects, and matching tiles. There are no puzzles to complete. My only complaint is that there were too many swap tiles. However, if you like matching 3 more than the other panels you would enjoy this game. Rated 4 out of 5 by crisgori from Nice but too difficult This is a nice game, with pretty graphics and very original for the variety of the things to do. The only problem is that the timer doesn't fit to the M3 tasks : too fast. Rated 4 out of 5 by schnauzermoms from More fun with crabs I have played HWOD & HWOD2 and totally fallen in love with the little crabs. I do have to say that other than the storyline of rebuilding Atlantis, it was pretty much the same game as HWOD2. That being said, I really did enjoy this game. It took a lot longer to play through than I expected and I was disappointed when there weren't any new characters or elements introduced. Nevertheless, I loved it! 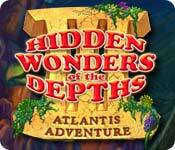 Rated 4 out of 5 by moonflower54 from Hidden Wonders of the Depths 3: Atlantis Adventures Excellent Match 3 game! Very colorful, challenging and appealing theme well done. Too quick paced for me. Requires good eye coordination and focus. My poor vision made advancing on time rather difficult. After a super long day at my business, I prefer less challenge, but I definitely recommend this game. One feature, which both humored and annoyed me, but certainly made this game more fun and challenging, is when the crab boos you and sticks his tongue out at you. The crab requires some patience! Rated 4 out of 5 by sereneorchid from Lots to like, but... Lots to like, with good graphics and animations, a mischievous crab that boogies and sticks its tongue out at you, and a skip option if you can’t solve a level. There are also HO puzzles and mini-games. But my problem with the game is the point of the game: to move the crab along a pathway to a treasure chest. Sometimes it’s hard to figure out which matches will move the crab along. Some matches don’t do anything, while other accidental ones cause the crab to sidle along. Maybe if I played the game longer it would all click for me. But right now, it has more frustration for me than I like in a game. Maybe your brain will process the challenge differently. 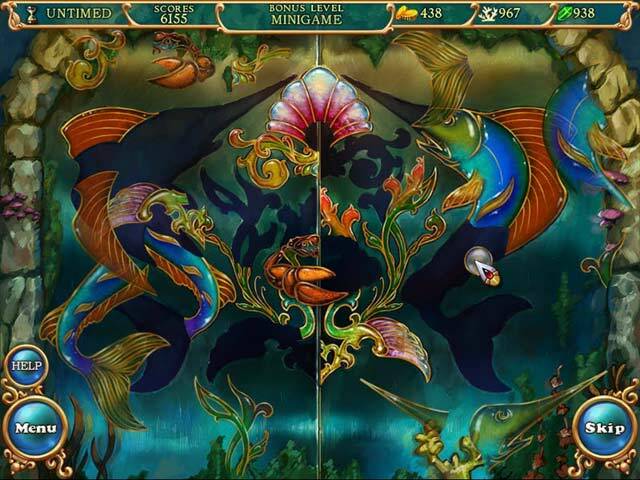 Rated 4 out of 5 by Rebr2009 from Very relaxing Match 3 Fun and varied game. 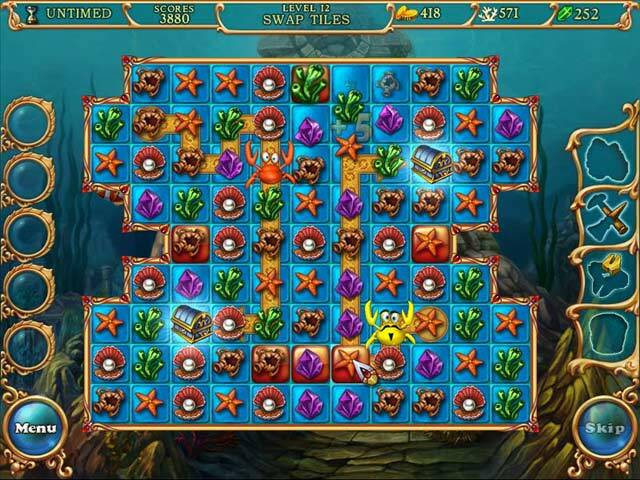 Besides match 3 (bring the crab to the treasure), have tools to collect, locations to rebuild and goals to be achieved. On some levels, two crabs in different areas, have to reach their treasures. Colorful and very well drawn. Music is nice too. Rated 4 out of 5 by pietmondrian from addiction at its worst Beware! Once you start this game you wont be able to stop!! And it is a long... long game to play. Simple to play but very addictive HO element is a bit of an afterthought Be warned - my top score (at the end) was more than 210,000! Rated 3 out of 5 by iamalulu from Too many of the same puzzle type This version of the game consists of way too many swap puzzles and there is almost never enough time to complete the match puzzles. When you get to 239 it is next to impossible to complete. I finally had to replay the whole game in order to get to 239 with all of the powerups available...without them you are probably not going to complete the puzzle or the game. Rated 3 out of 5 by magigirl from Perhaps Game fun, constant lights, NO! I deleted this game just because I found fickering lighting distracting and aggravating. I couldn't find a wayt to stop it. If there was the option, I would re-install the game. If you are OK with the flickering path and other lighting, it is a nice game to relax with. Rated 3 out of 5 by toniaa from Frustrating Hidden Object Game I have all three in this series and this one is too too frustrating because without a skip button, which it doesn't have, I have found it impossible to advance past level 230 something. It's my least liked board since the multiple click chains are not that interesting; yet being hooked, determined to play through to end I have spent days trying to conquer the level which is timed too short and get busted before the last few chains are broken. With no skip level feature, impossible for me to move on. I give up. so beware if it matters that you finish you may become just as irritated as I am right now. Other than that great game. Rated 2 out of 5 by SummerSkyeSloane from Such a Hard Game for Me to Play! Basically, all the player has to do in this game is to get a cute crab from Point A to Point B [hidden treasure] at each M-3 level. A specific path must be followed or the crab cannot move and often, the Match 3 items are far away or at least not where you want them. I found it very hard to advance my sea critter and he was heard to yawn several times because my pace was so slow. No kidding! [Luckily, I was in untimed mode.] There are HOs too and mini-puzzles [including a skip option]. Power ups are also available and eventually, you earn enough money to rebuild Atlantis. The graphics and music are excellent and I rated those 5 stars but I really found it quite a challenge to get my crab moving and stop him yawning rudely...so I uninstalled after about an hour [IF that]. Rated 2 out of 5 by NaughtyPenguin from Could have been a 5 Not your typical match-3. You have to get the delightful little crab to follow a specific path. His little sighs, boogie routine, and silly antics give the game real character. I've played the game at least a dozen times but I'll never play it again. I finally figured out that the scoring makes no sense so playing multiple times is meaningless. There is no time bonus so the longer it takes you to get the crab to the treasure chest, the more points you get. This translates to mindless clicking of matches to run down the timer. You also get more points if you fail a level and have to play it multiple times. Trying for low score doesn't help because you get a really low score if you run out of lives after playing a few rounds. So basically, this is a 'play it once' game. While they're at it, the developers should have an option that doesn't require you to click through the tutorial every time you play. A less annoying timer sound would also be nice. Rated 1 out of 5 by TootsSweet from Hated this one I don't leave reviews often, but, I had to on this one. I loved the first 2 games, but this one, it is so hard by the time you reach the levels in the 30's, that you have to be a guru to win. Never had a problem winning on the timed games in the first 2 of this series. I am really tired of how hard they make the goals after a few levels. I would have liked to finish it, but, you can't switch from timed to casual without starting a new game. I'm not about to start this over after being up to level 37 and couldn't win it.